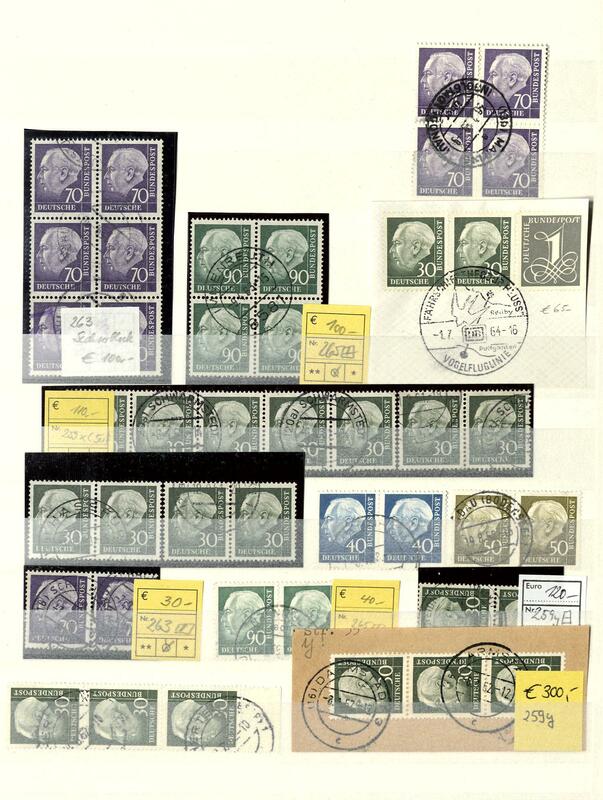 2337 x Federal Republic of Germany - extensive inventory from mint never hinged issues packed in a carton, as well complete years, numerous coil stamp for vending machine, souvenir sheets and so on. Favorable! 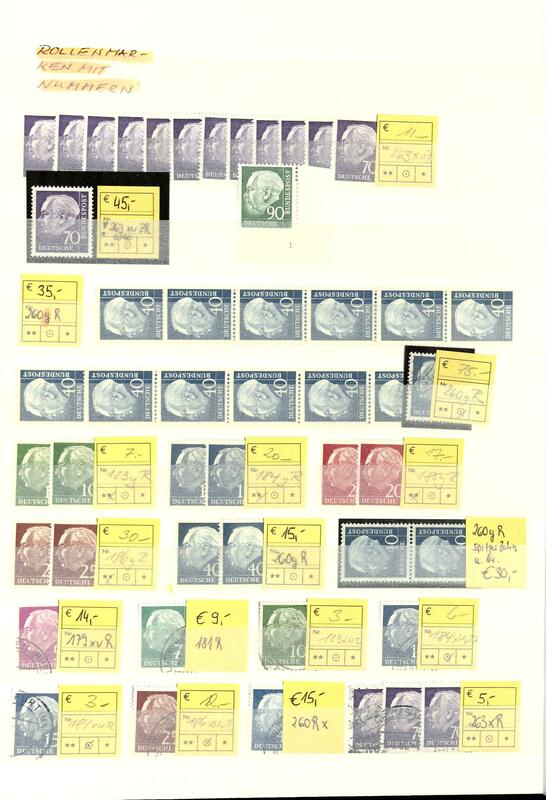 2344 /⊙ Federal Republic of Germany - nice and rich collection with issues the seventies years parallel mint never hinged respectively used collected in two stock books with lots of material. 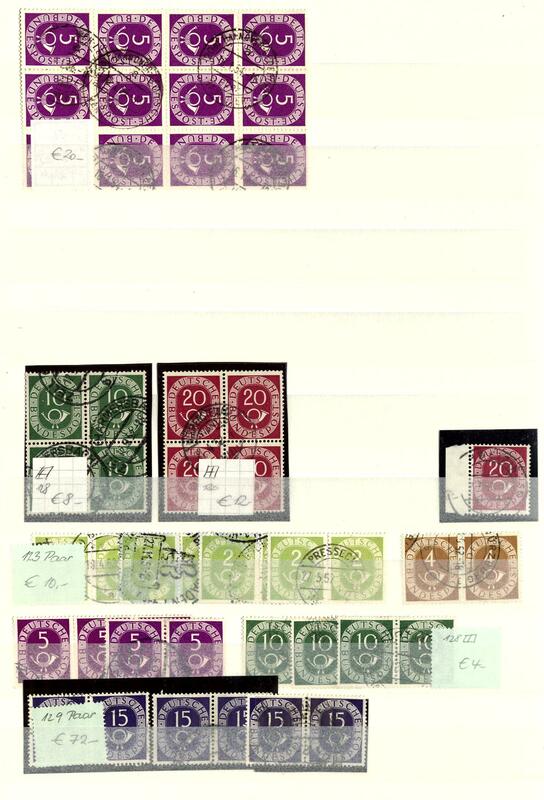 As well a large number corners of the sheet, also form numbers, nice corners of the sheet with centered First-Day- and special cancellations and so on. A magnificent object! 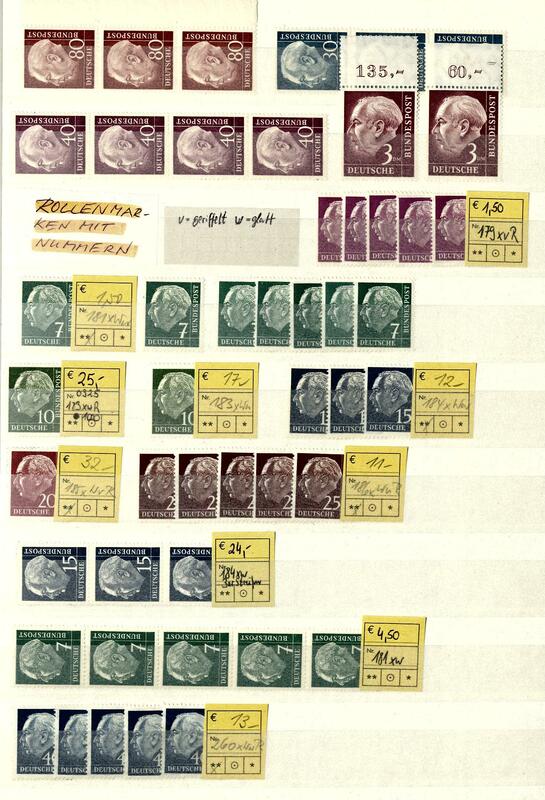 2347 Federal Republic of Germany - 1954 / 60, nice mint never hinged lot of predominantly corners of the sheet in the stockbook accommodated, as well numerous form numbers, partly also various form numbers the same issue, postal stamps values, special- and commemorative issues and so on. An attractive object! 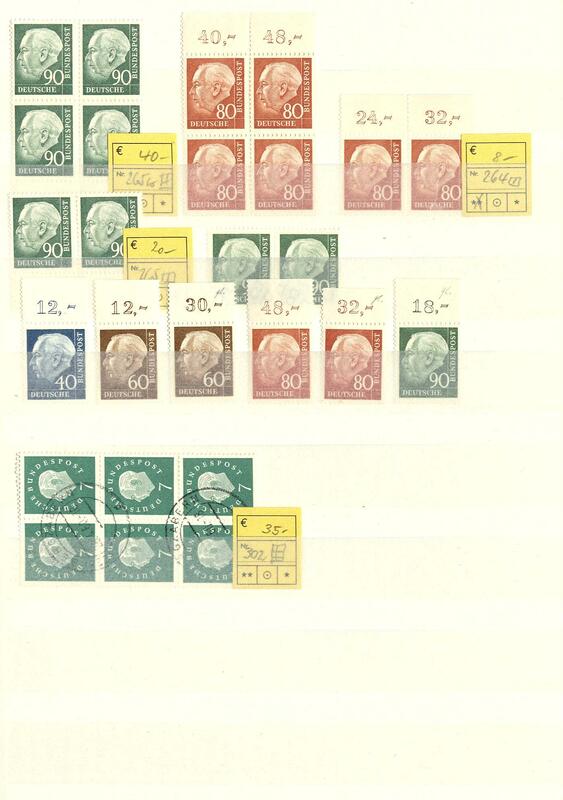 2368 Federal Republic of Germany / se-tenants - 1956 / 96, nice mint never hinged collection different se-tenants in the safe hingeless printed form ring binder. 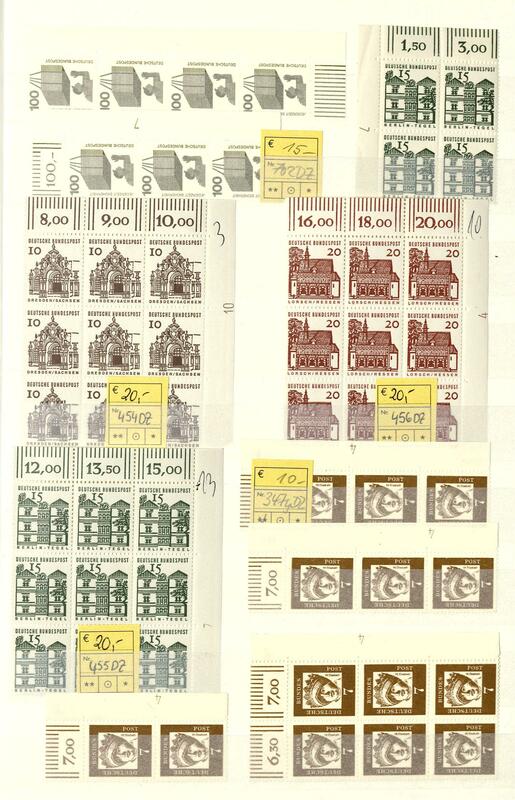 As well a nice part Heuss with different combinations, advertising imprint, gutters, a very good part Heuss watermark sideways with useful combinations including eight different se-tenant the good 8 Pfg., as well numerous further issues, with also se-tenants from souvenir sheets, all Olympic Games se-tenants 1972 complete including the gutters and so on. A beautiful object! 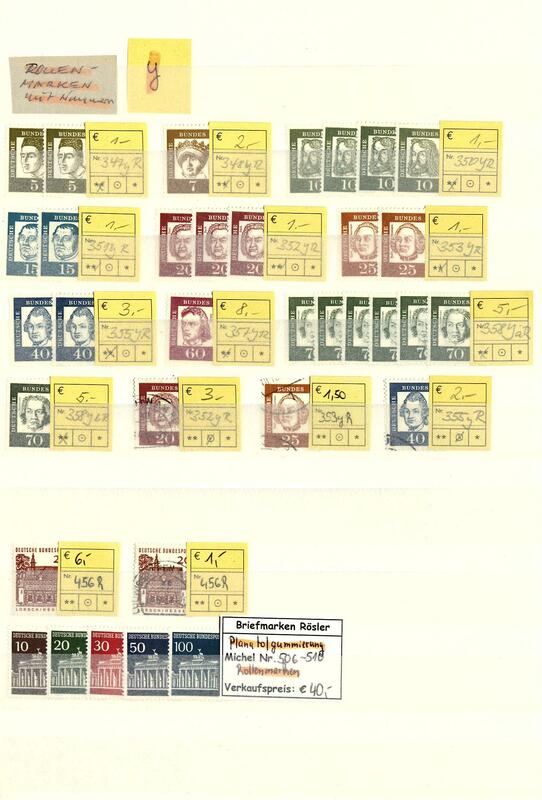 2371 /⊙ Federal Republic of Germany - 1949 / 89, extensive lot, all mainly mint never hinged on stock pages (46 sides). 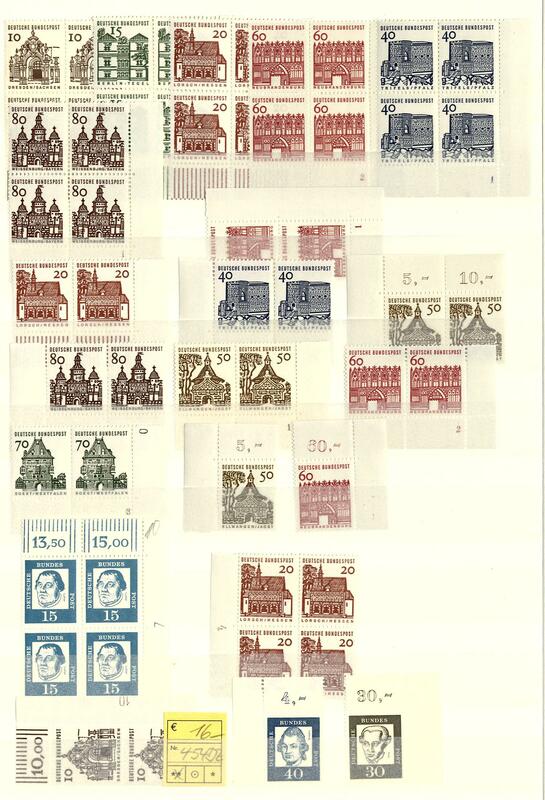 Many sought specialties, enormously many corners of the sheet from Lower House of German Parliament 1949, also 10 Pfg. 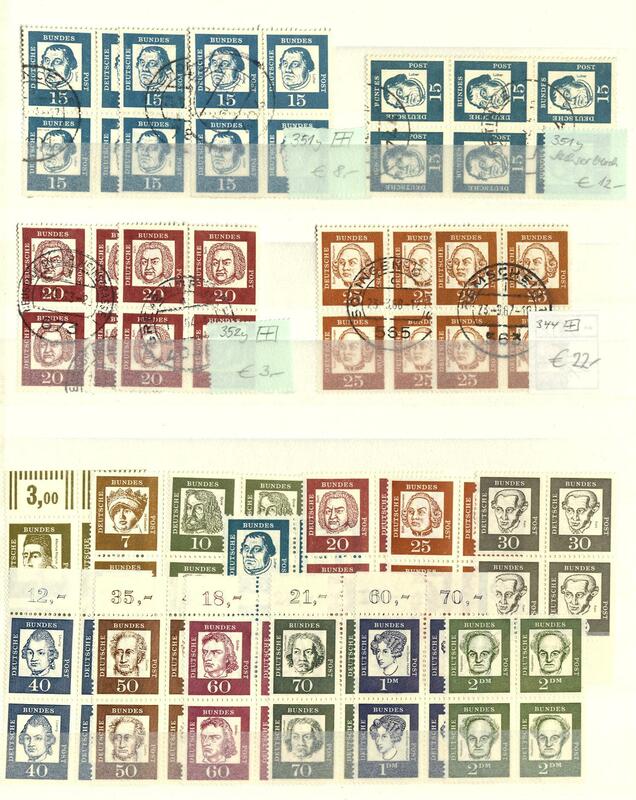 Lower House of German Parliament from lower margin with plate number 11, as well a huge special part postal stamps from posthorn including Heuss, many corners of the sheet, horizontal pairs, blocks of four, printer sign, also 70 Pfg. Posthorn in the horizontal pair, 90 Pfg. 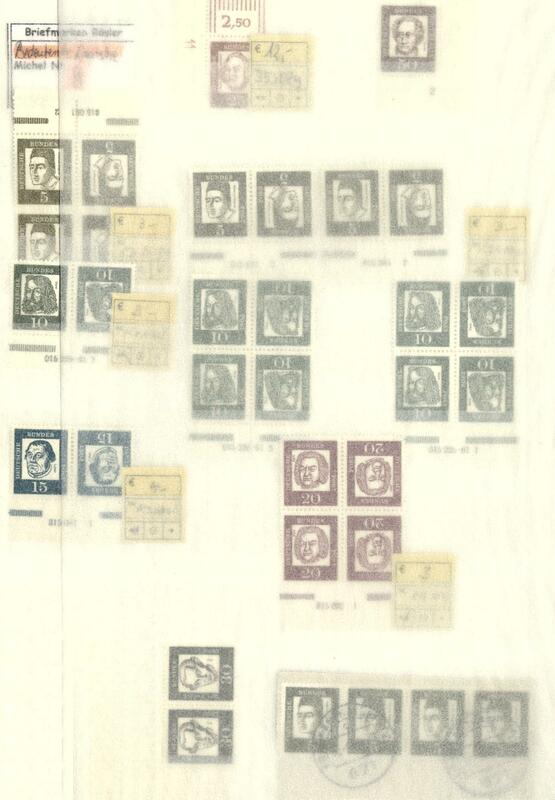 Posthorn in the horizontal pair used expertized Schlegel BPP, many horizontal pairs and blocks of four the Heuss issue mint never hinged and used including better values, also the 70 Pfg. 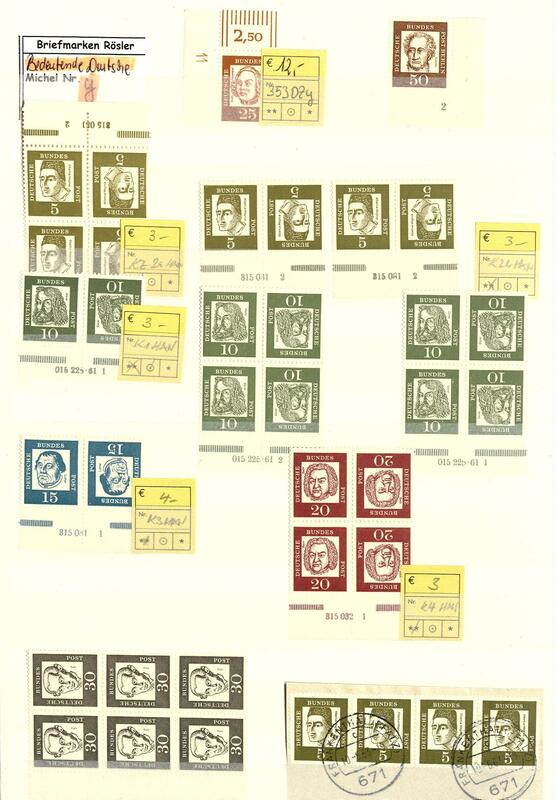 With three used blocks of four and an used block of six, also Heuss II with good used multiples, an extensive part important German, with also a complete used block of four set also further larger multiples and so on. A grand inventory for specialists, the be also outstanding to the liquidation is suitable! 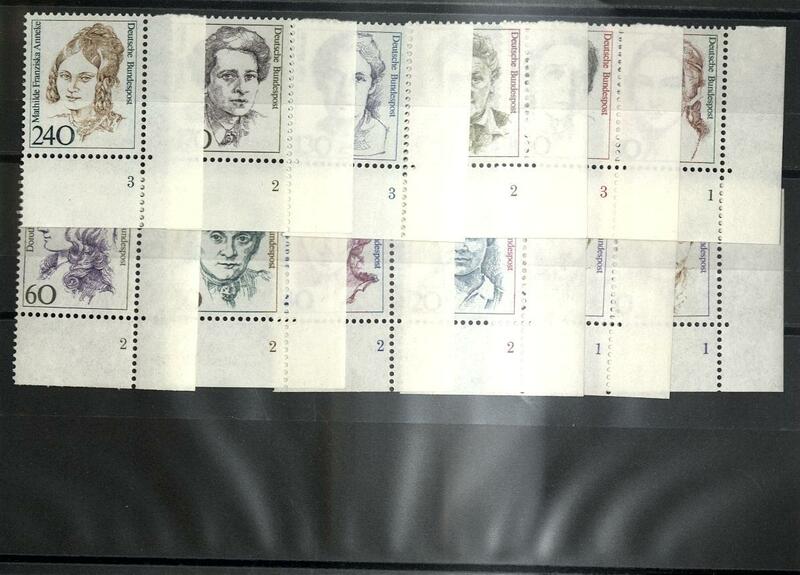 2372 Federal Republic of Germany - 1980 / 2002, extensive mint never hinged special collection the coil stamp for vending machine housed in two large stockbooks. 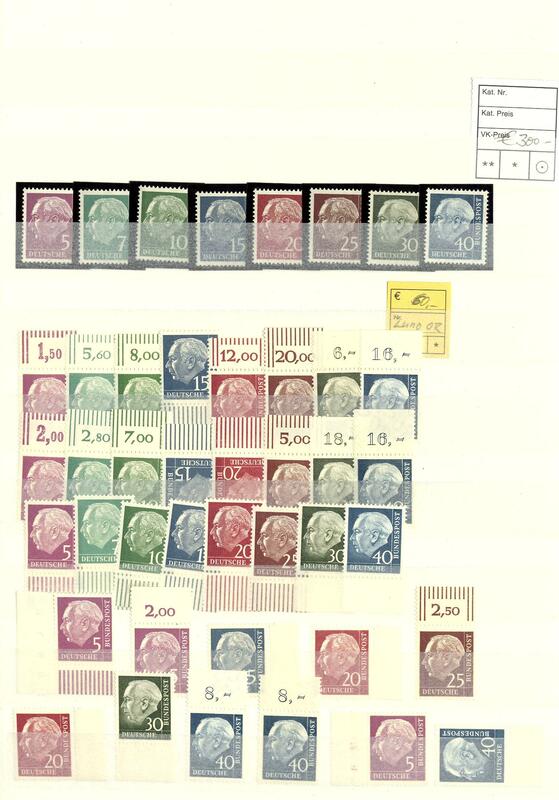 As well various issues, denomination value, mixed types / prints, receipts and so on, also a few used issues are contained. 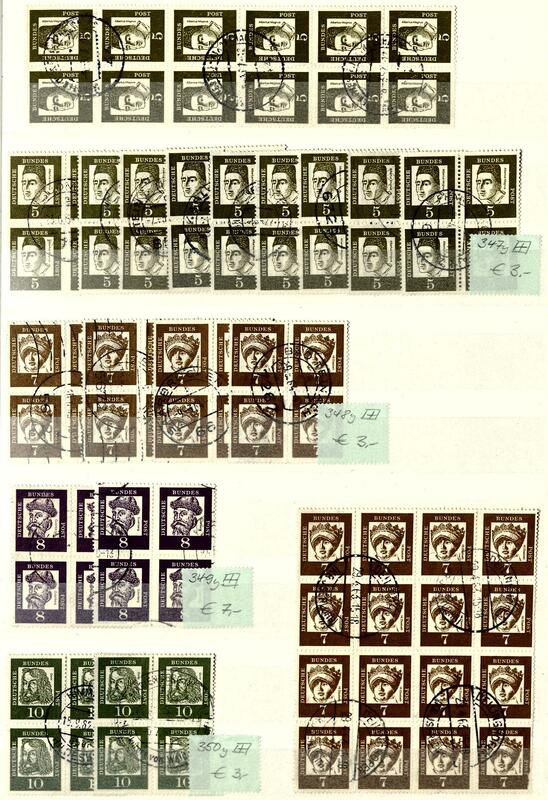 A magnificent object with enormous acquisition price! 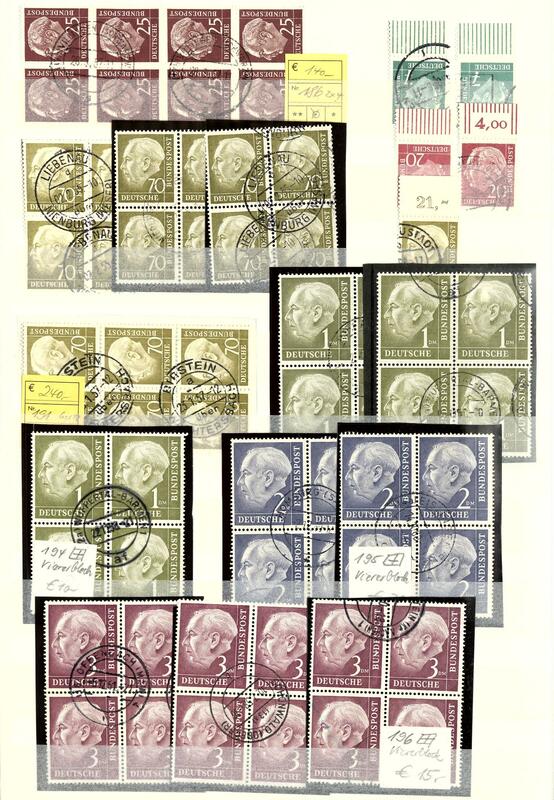 2433 Federal Republic of Germany - 1949 / 2000, nice mint never hinged collection, complete with all issued stamps in four Lindner hingeless printed form ring binder. 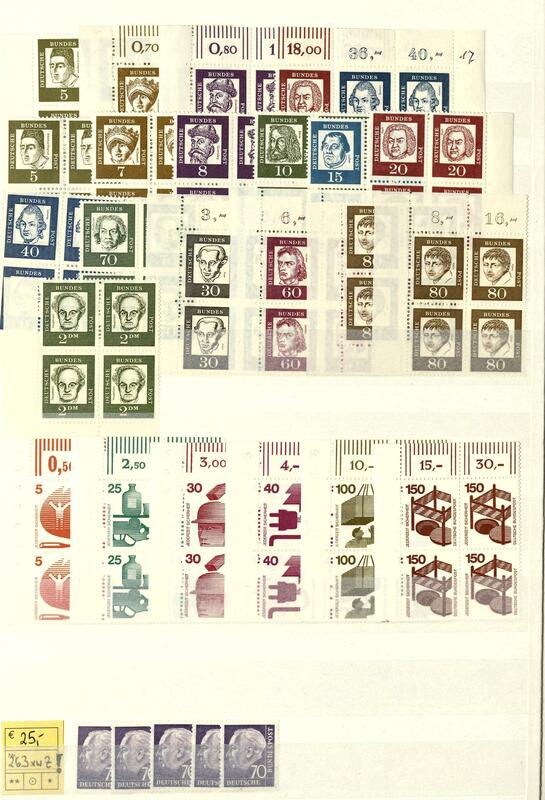 And, of course, all good first issues including Lower House of German Parliament 1949, 100 years stamps, Stephan, all sets helper of human resources, Bach seals, posthorn set, St. MaryÂ´s Church, Heuss 1954 and so on. A very nice object! Michel approximate 7700,- €. 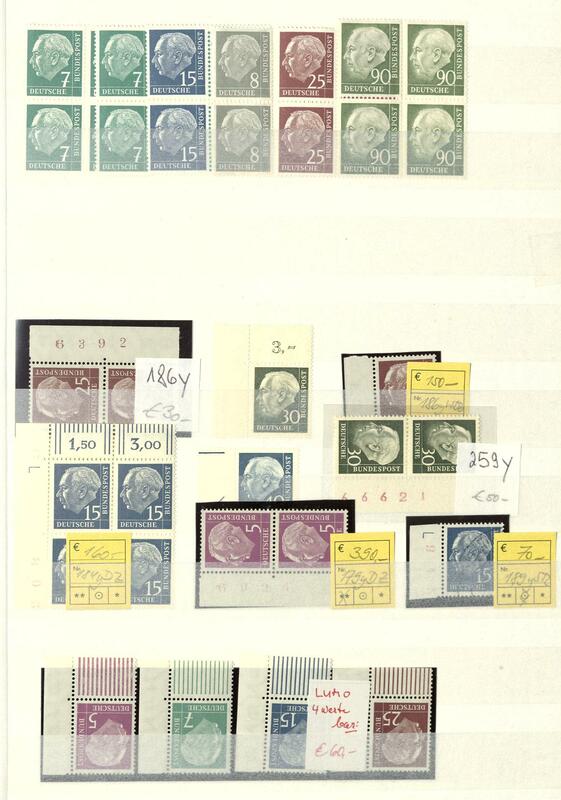 2434 ⊙ Federal Republic of Germany - 1960 / 99, very nice used collection, in the number of a major listing complete (without Heuss fluorescent and watermark sideways) in two KABE hingeless printed form albums. 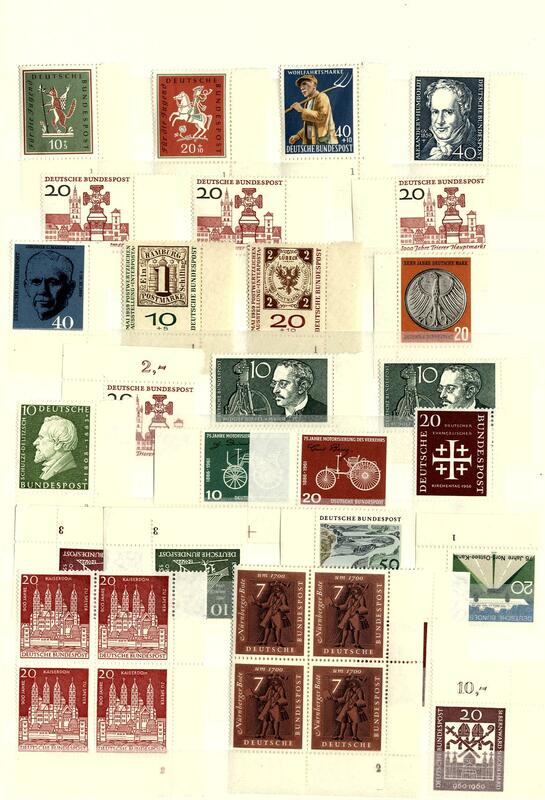 The collection is almost exclusively centric used collected. 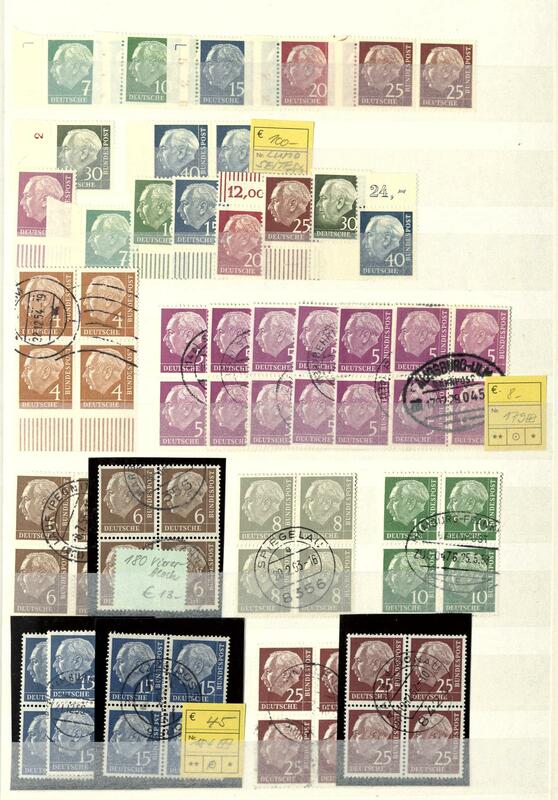 An especially nice exception object, there especially the issues the sixties years with centric postmarks much sought after are! 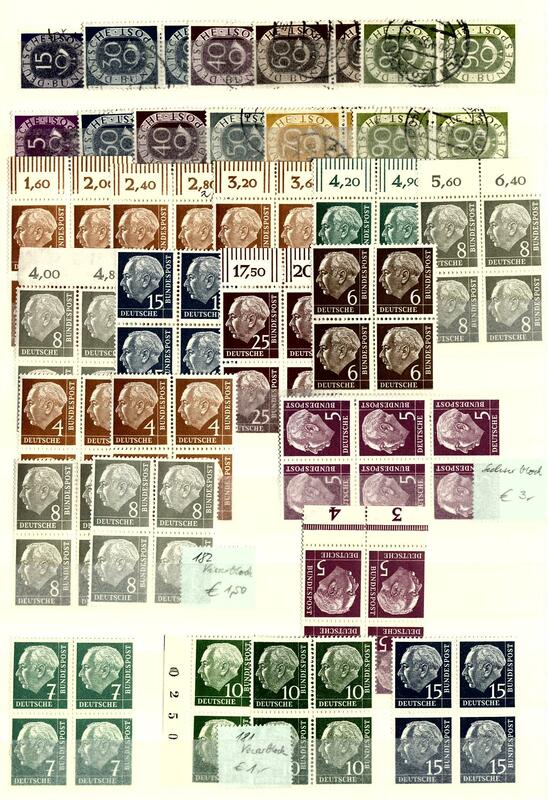 2436 x Federal Republic of Germany - extensive lot packed in a carton with numerous issues on stock cards, many beginning valued from Lower House of German Parliament 1949, St. MaryÂ´s Church, Bach seals twice, the three posthorn top values, good sets helper of human resources and much further material. Very favorable! 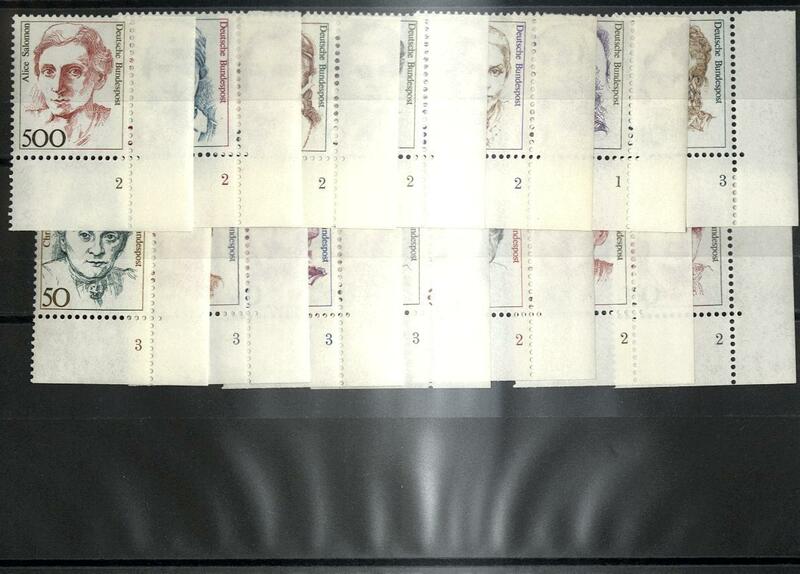 2476 ✉ Federal Republic of Germany / coil stamp for vending machine - enormously extensive special collection from covers and cards the coil stamp for vending machine 1981 in seven ring binder formed. 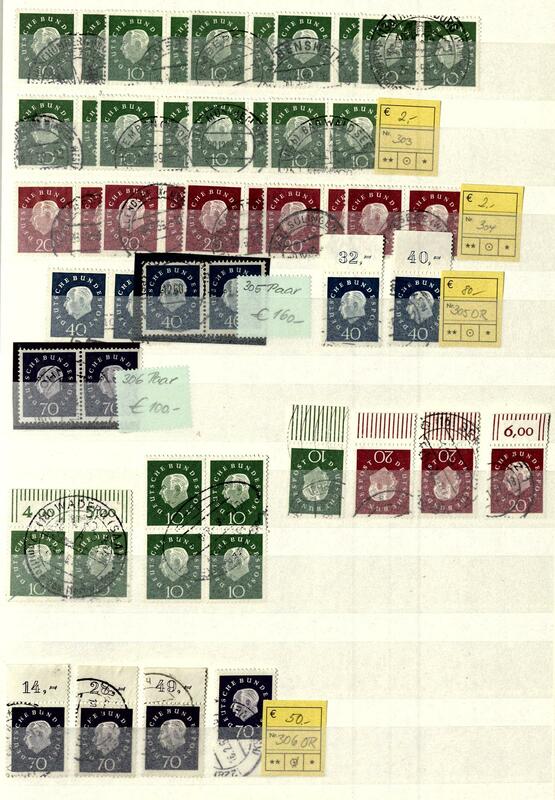 As well enormous amount of material, many interesting documents, various postage steps and use form, high denomination value, interesting multiple franking, various franking combinations, various cancellations and so on. 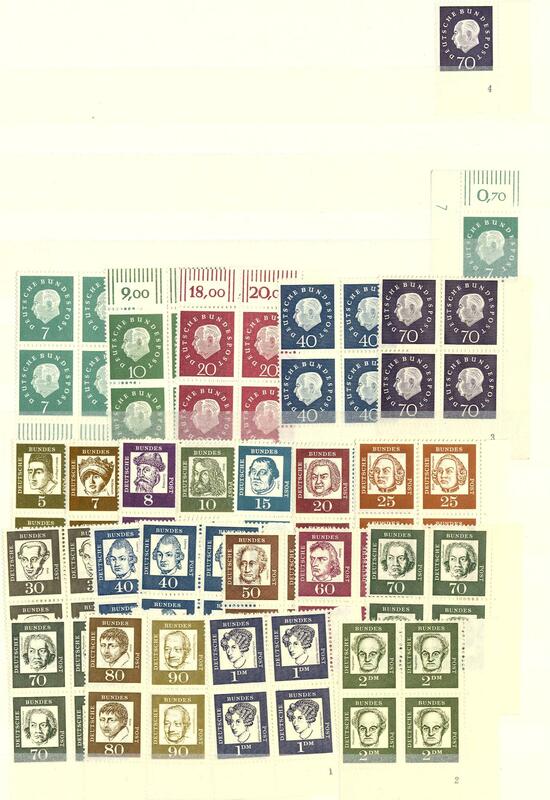 In this enormous richness and variety rare offered. Huge purchase price! 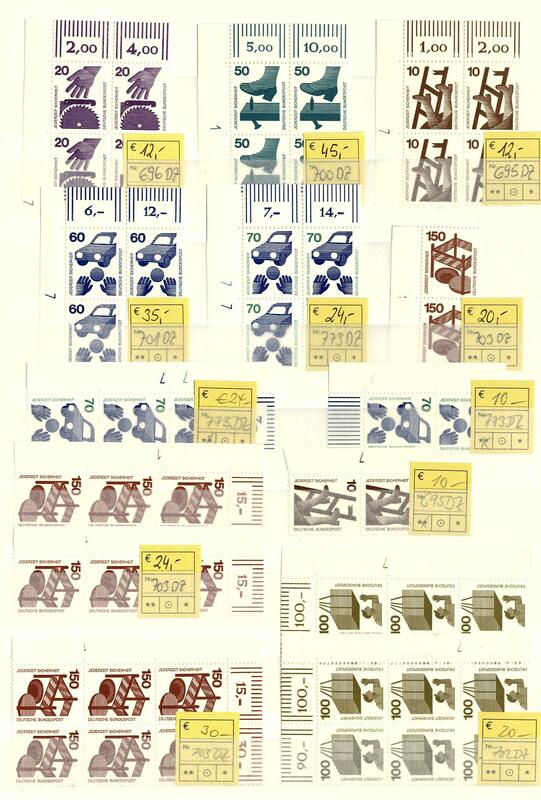 2477 x Federal Republic of Germany - extensive lot packed in a carton, much material, mostly mounted on pages and stock cards, thereby also good part beginning years including posthorn set, better special- and commemorative issues, 100 years stamps, helper the humankind sets, St. MaryÂ´s Church, also American/British Zone export fair souvenir sheet used, many complete mint never hinged volumes Federal Republic of Germany on hingeless preprinted pages and so on. Very favorable! 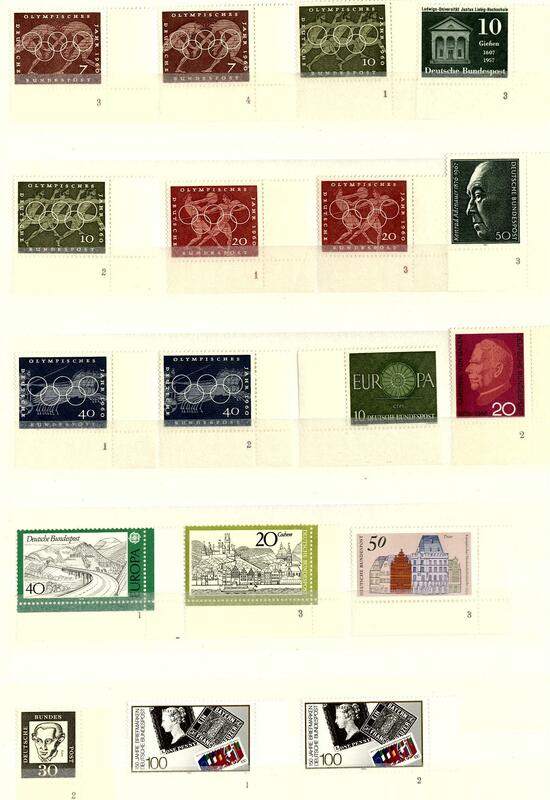 2479 / Federal Republic of Germany - 1949 / 2000, complete collection with all issued stamps in four Lindner hingeless printed form ring binder. 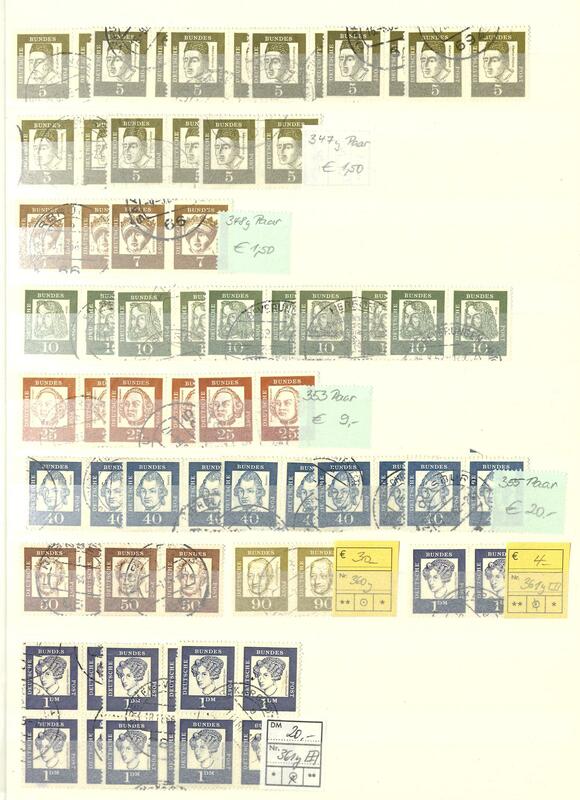 And, of course, all good first issues including Lower House of German Parliament 1949, 100 years stamps, all sets helper of human resources, posthorn set 1951 / 52, St. MaryÂ´s Church, Wuppertal series, Heuss 1954 and so on. Favorable opportunity! 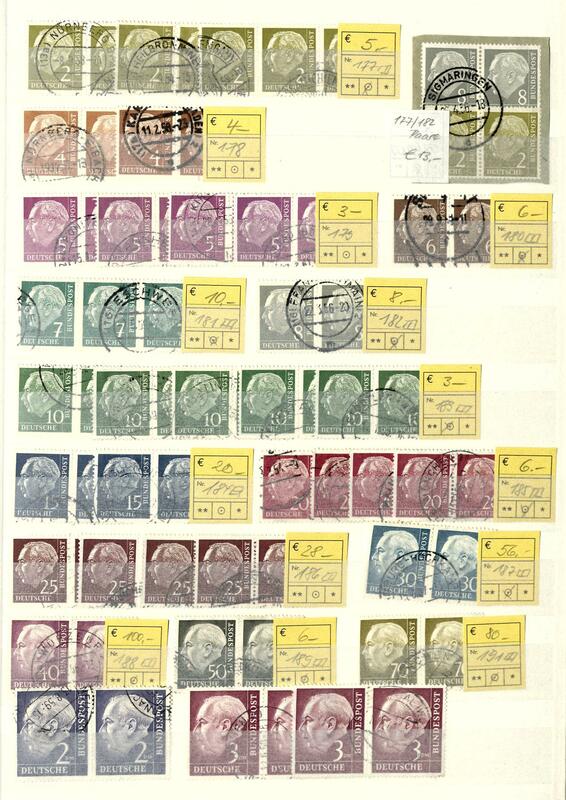 2534 /⊙/ Federal Republic of Germany - 1949 / 78, extensive collection in the thick safe hingeless printed form ring binder, frequently twice collected with plenty of better issues of the early years. 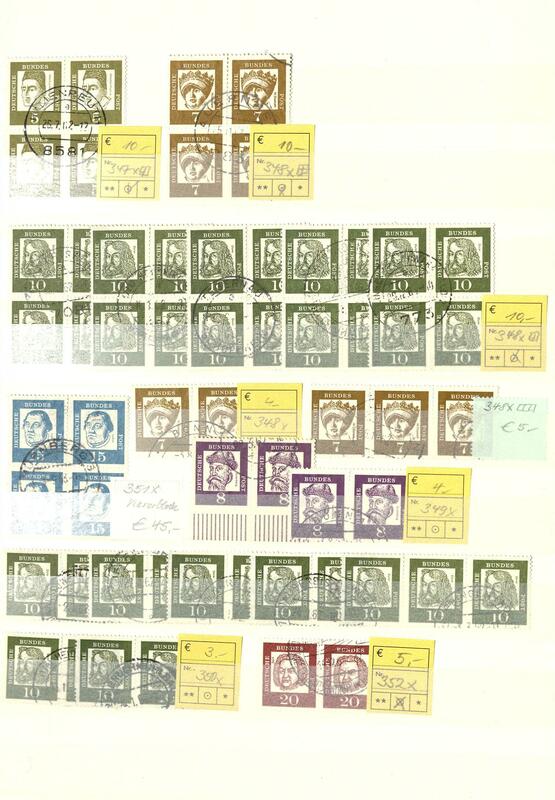 As well Lower House of German Parliament 1949 twice, 100 years stamps twice, Stephan twice, welfare 1949 twice, Bach seals twice, St. MaryÂ´s Church twice, Wuppertal series twice, welfare 1951 twice, welfare 1952 / 55 twice, Heuss 1954 mint never hinged and many further issues. Very favorable! 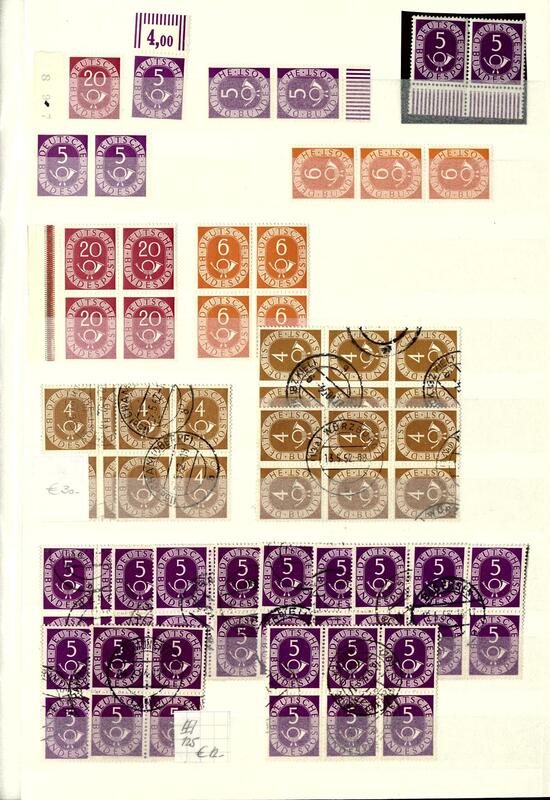 2535 /⊙ Federal Republic of Germany - 1949 / 54, nice and extensive inventory the early years in a large stockbook. 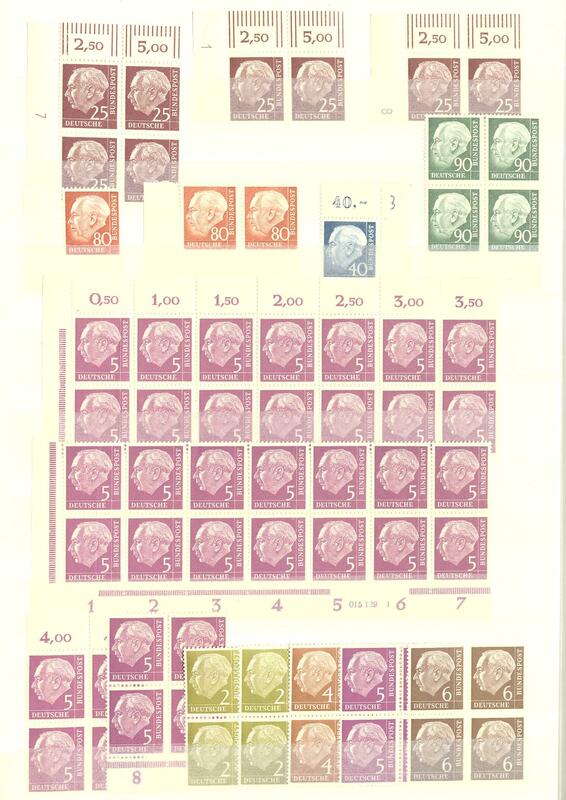 As well a great many better issues, an extensive part mint never hinged sets and so on. 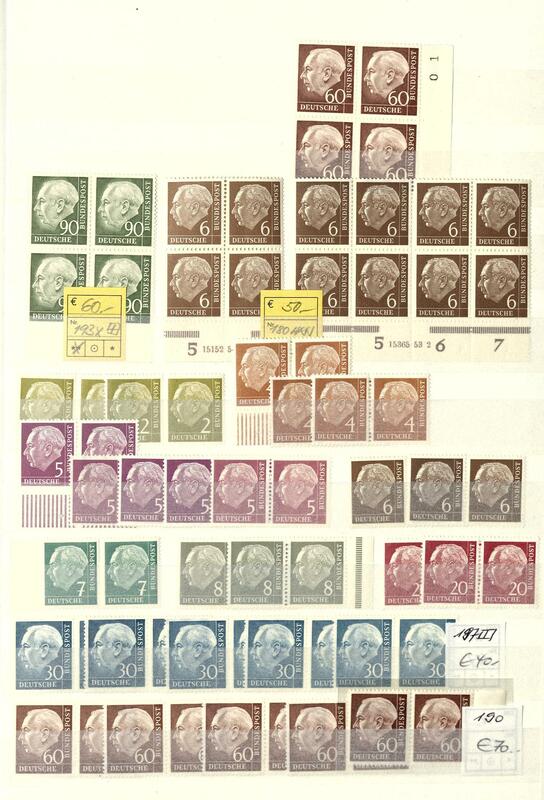 Included are for example Lower House of German Parliament 1949 four times, 100 years stamps 1949 four times, Stephan four times, 30 Pfg. 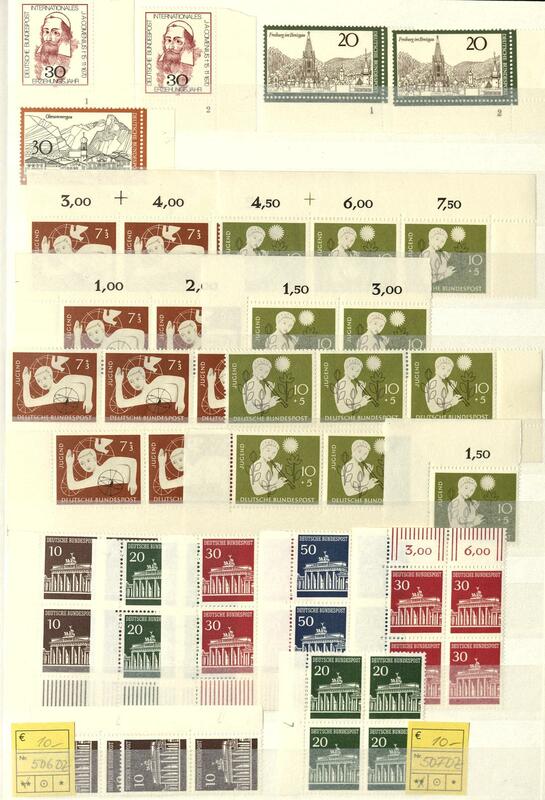 Welfare 1949 mint never hinged, Bach seals, St. MaryÂ´s Church three times mint never hinged, Wuppertal series mint never hinged, youth 1952 three times mint never hinged and once used, welfare 1952 three times mint never hinged, transport exhibition 1953 twice mint never hinged and twice used, Ifraba three times mint never hinged, welfare 1953 twice mint never hinged, Heuss 1954 mint never hinged, welfare 1954 twice mint never hinged, 40 Pfg. 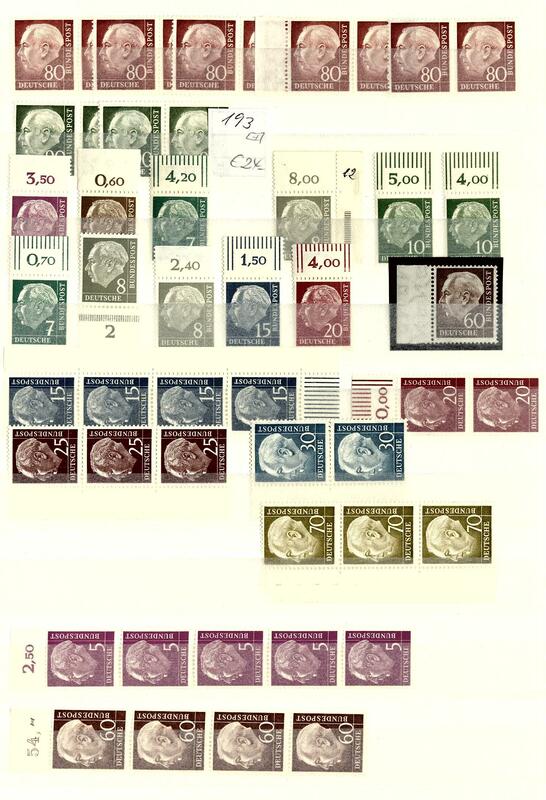 Welfare 1955 six times mint never hinged and so on. 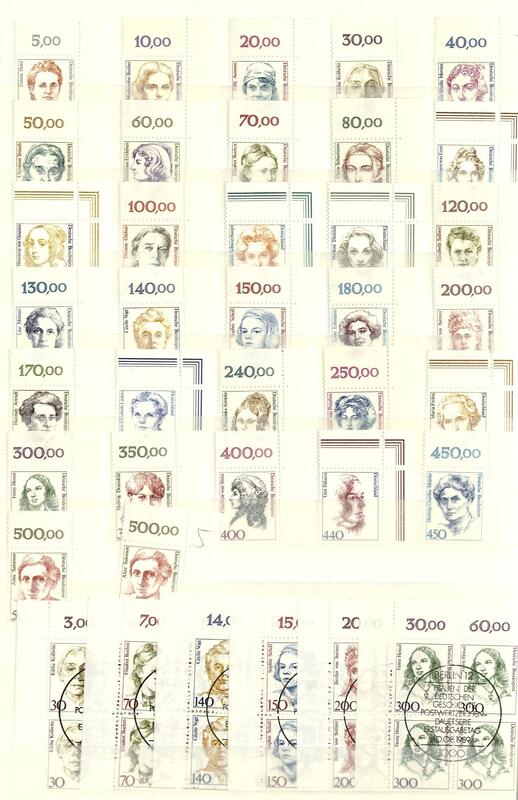 Michel approximate 7600,- €. 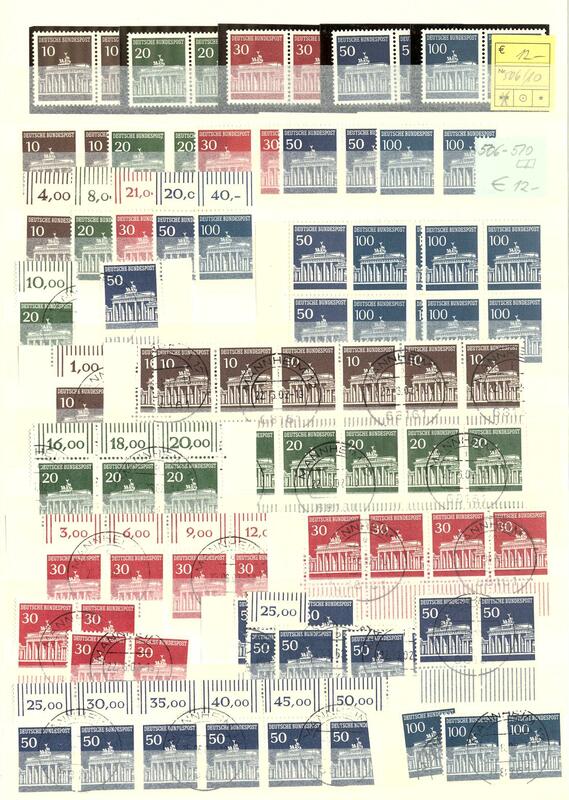 2536 ✉ Federal Republic of Germany / post war - very interesting and extensive special collection from post-war letters from the years 1965 / 67 in the ring binder with numerous extraordinary documents all with the displaced people stamp franked, often with additional frankings. 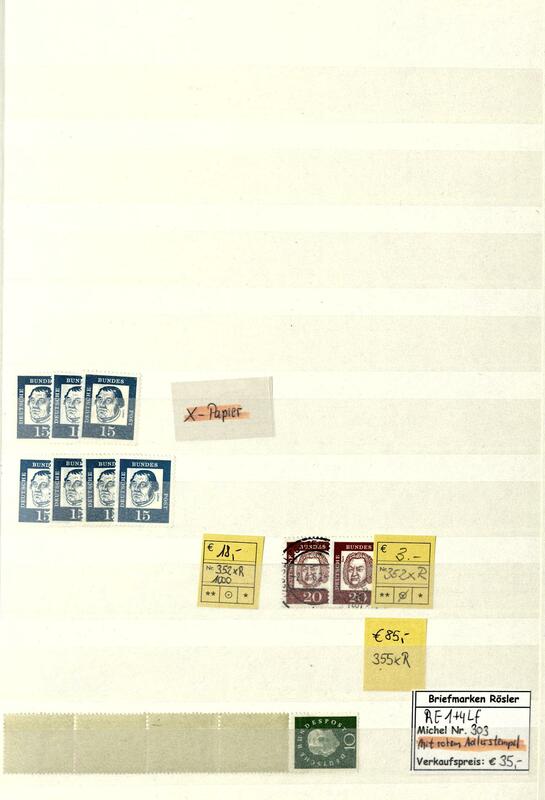 As well numerous black over painting, further defacings, many return documents and so on. 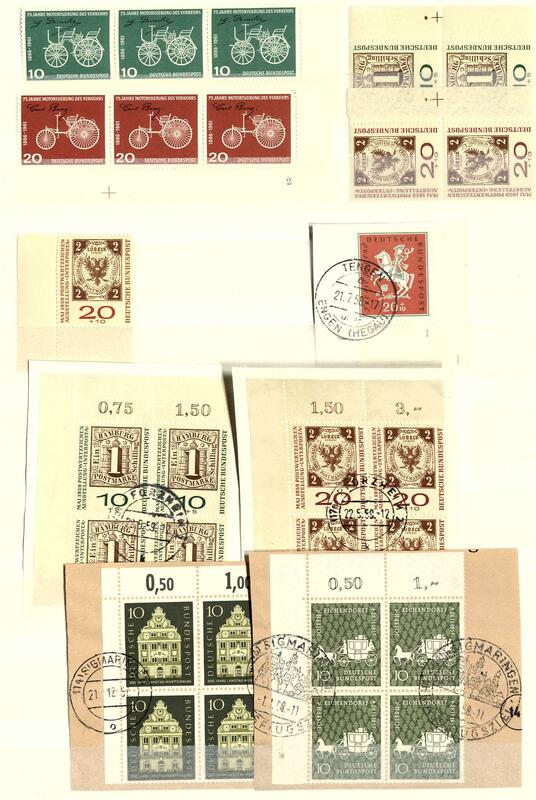 In the German Demokratic Republik (East Germany) used respectively to Poland, Russia, Czechoslovakia, Bulgaria and China. 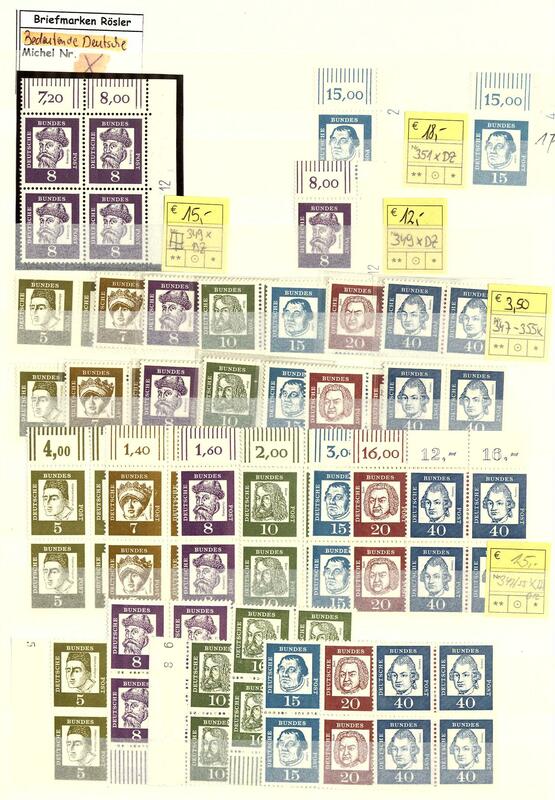 In total includes the collection 41 documents. Hardly ever offered in this richness and variety! 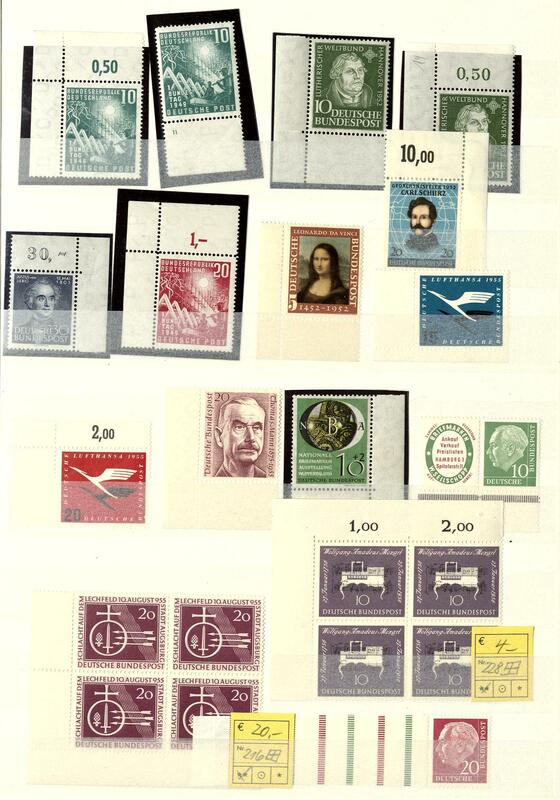 2537 ✉ Federal Republic of Germany / postal stationery - 1998 / 2011, very nice and extensive special collection the postal stationery covers, all unused examples in five safe ring binder formed. As well numerous popular issues, various types and so on. In this richness, so strong specialized become collections this attractive area hardly ever offered. 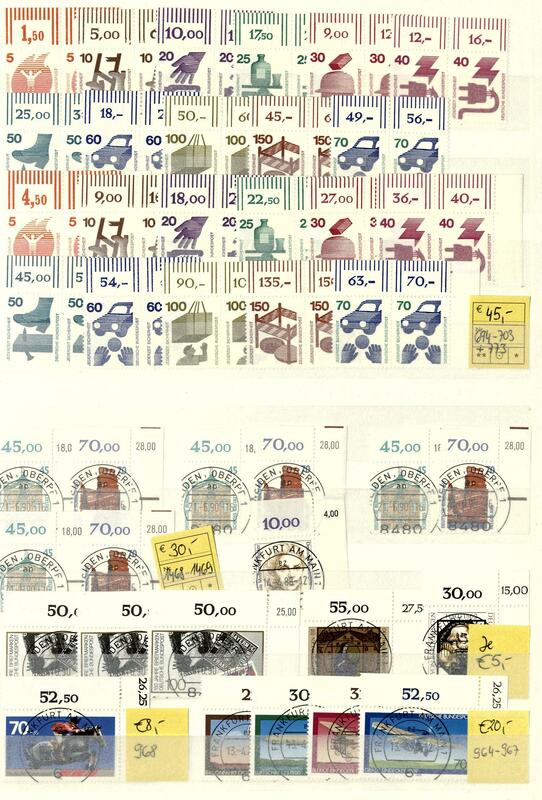 In total includes the collection 390 documents! 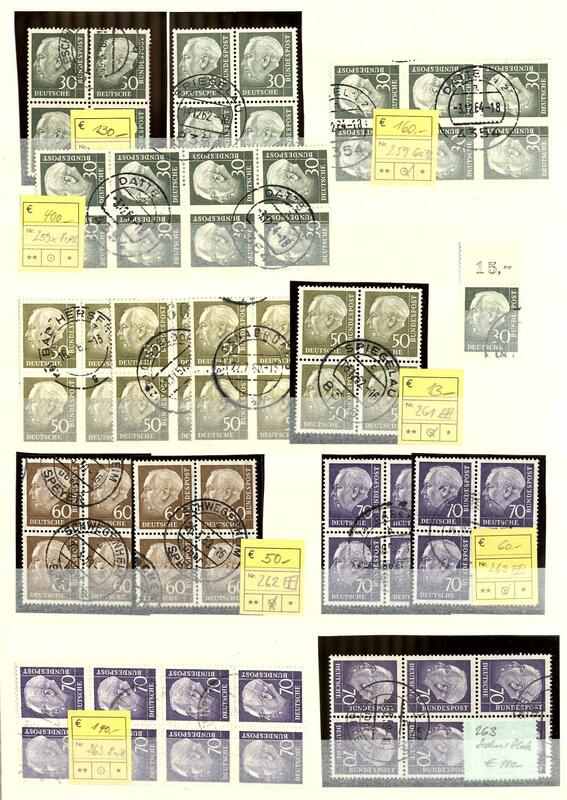 2601 / 136 Federal Republic of Germany - 1949 / 98, extensive collection, in the number of a major listing except for Michel no. 136 complete in four beautiful claret Lindner T hingeless printed form ring binder. 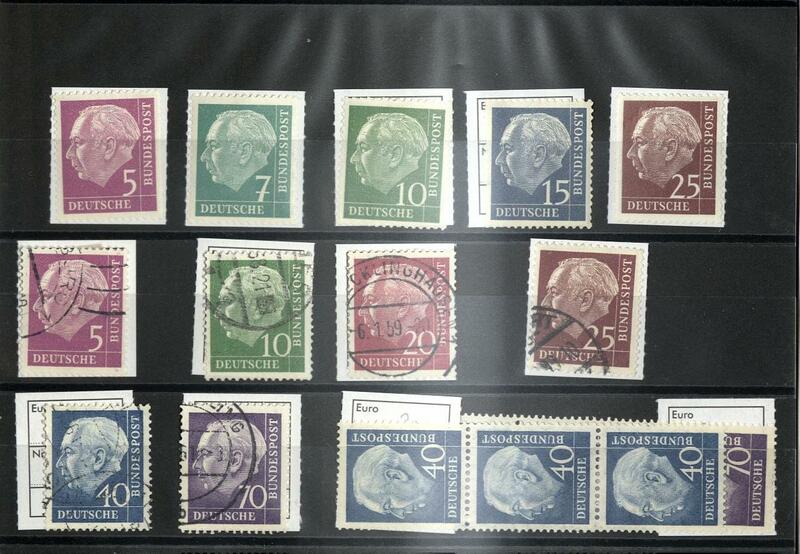 And, of course, Lower House of German Parliament 1949, 100 years stamps, all sets helper of human resources, St. MaryÂ´s Church, 2-60 Pfg. And 80-90 Pfg. Posthorn, Heuss 1954, Heuss fluorescent and watermark sideways and so on. 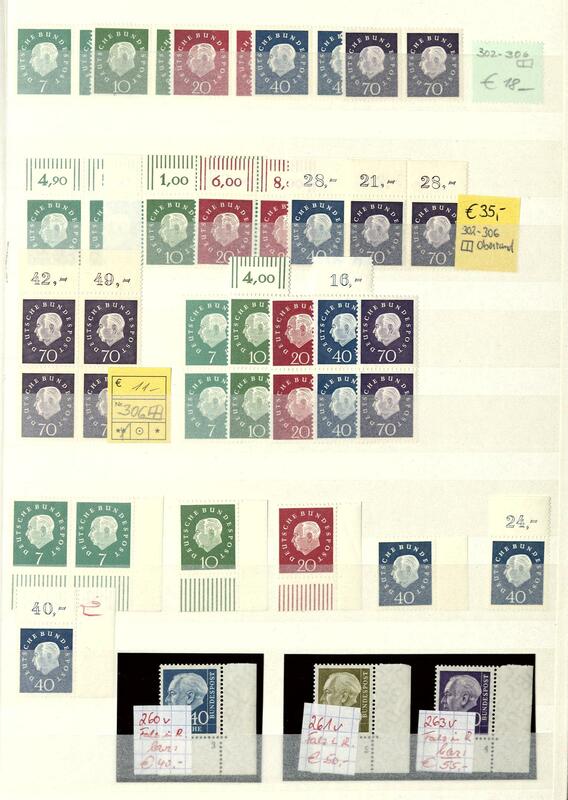 Very high catalog value, original price the albums already approximate 500,- €. Favorable opportunity! 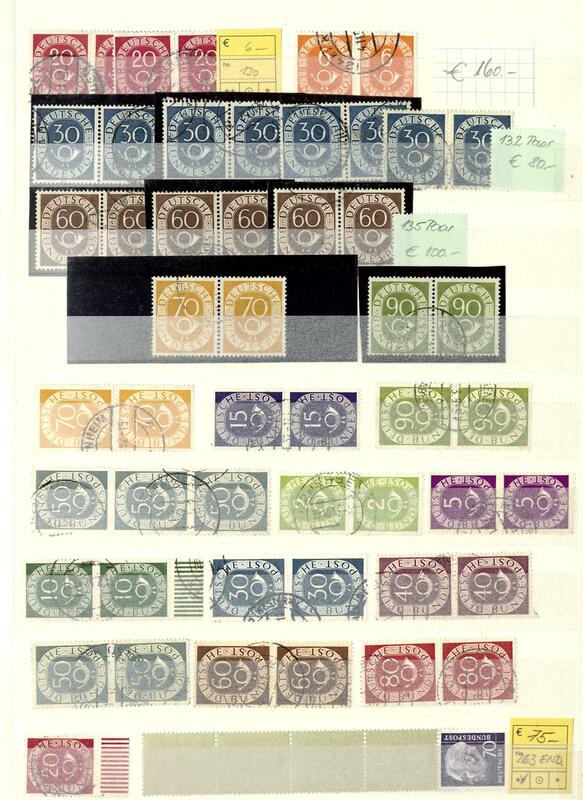 2663 x Federal Republic of Germany - extensive inventory from collections and lots in 10 large albums / stock books. 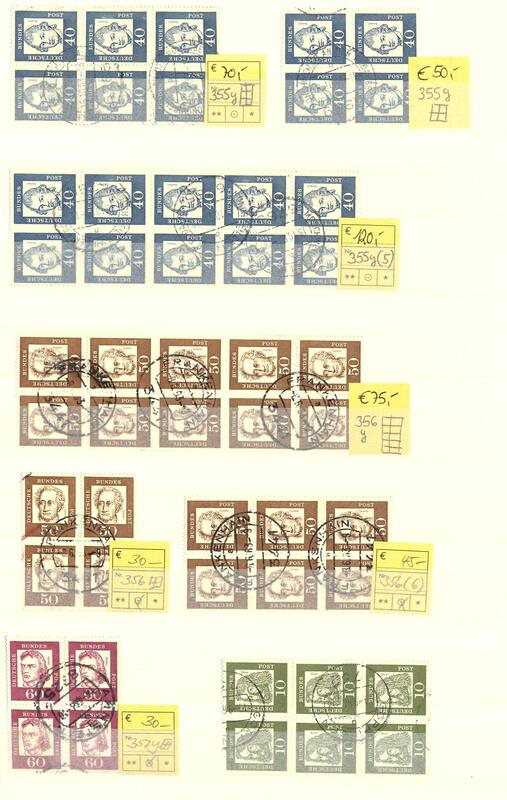 With also good first issues like Lower House of German Parliament 1949, 100 years stamps, welfare 1949, Bach seals, St. MaryÂ´s Church, welfare 1951, Wuppertal series, welfare 1952 (key value double), welfare 1953 (key value double), Heuss fluorescent, watermark sideways, lots of mint never hinged material, centric cancellation issues, an extensive inventory and so on. Huge catalogue value, very favorable valued! 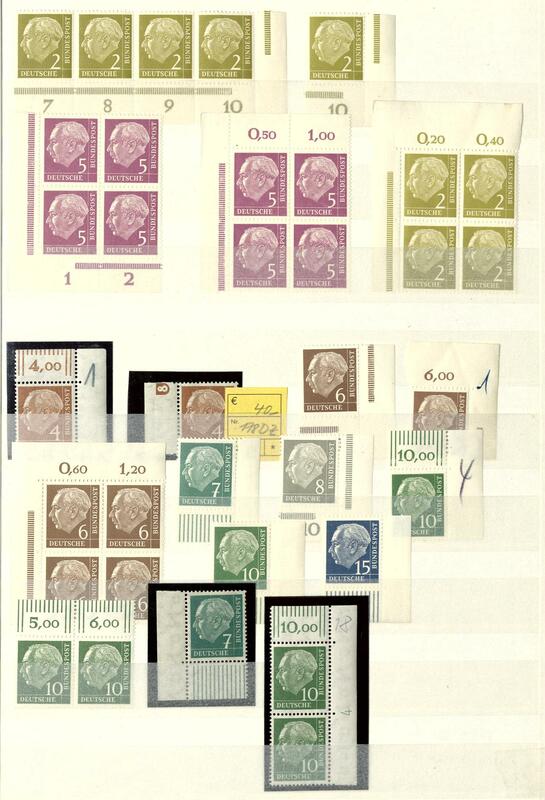 2666 ✉ Federal Republic of Germany - rich collection from covers and postal stationery in six albums accommodated with lots of material, interesting frankings, numerous officially postal stationery, private postal stationery, Lower House of German Parliament 1949. 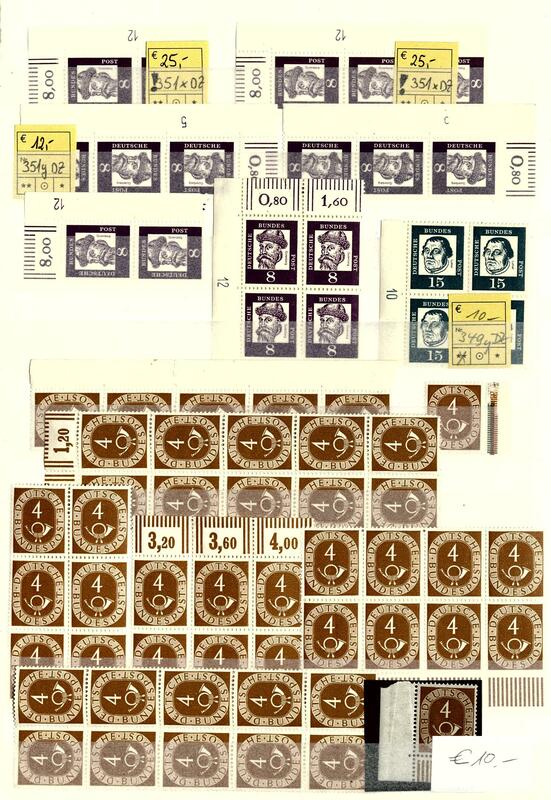 With also frankings of the early years, various postage steps, use form, numerous registered, interesting frankings from Beethoven souvenir sheet stamps, further souvenir sheet stamps and souvenir sheets on covers and so on. A beautiful object! 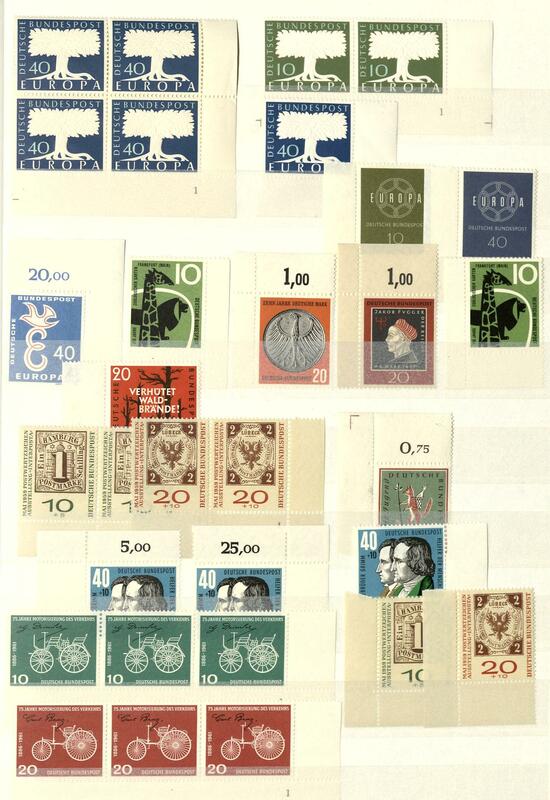 2667 / Federal Republic of Germany - 1949 / 72, nice collection, predominantly mint never hinged formed and complete with all issued stamps in the safe binary hingeless printed form ring binder. 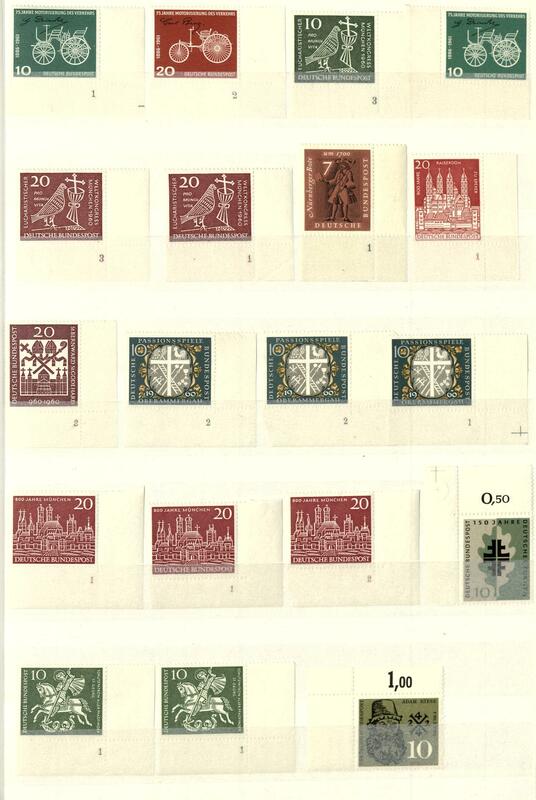 With also Lower House of German Parliament 1949, 100 years stamps, Stephan, all sets helper of human resources, posthorn set, St. MaryÂ´s Church, Wuppertal series, Heuss 1954 and so on. Favorable!